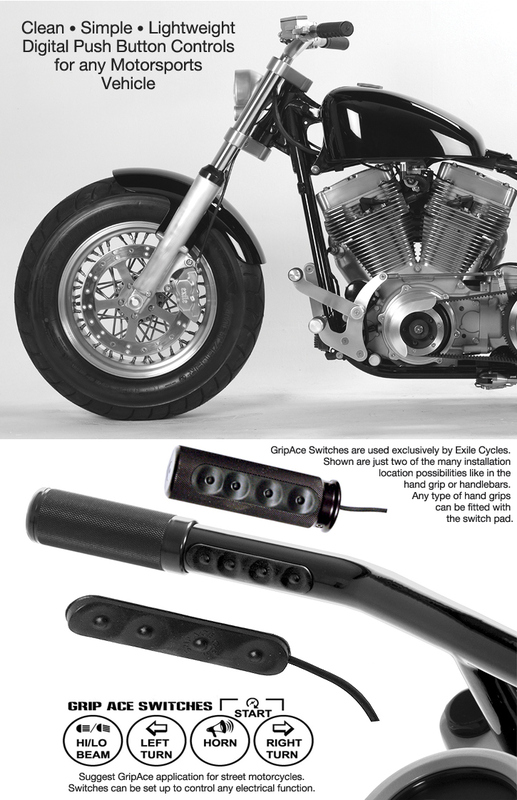 for your motorcycle or motorsports vehicle..
GripAce™ is leading the way into the digital age for the power sport industry with clean handle bars and no visible switches while still remaining legal. This is accomplished with the just one small wire routed through your handlebars to the GripAce™ switch pad under your fingers in the left handgrip. The GripAce™ System is easily fitted to any motorsports vehicle's hand grip or steering control - or anywhere else on the vehicle you would like to mount or hide it! Perfect for any Custom, Touring or Race Bike, ATV or Motorsports Vehicle to control almost any electrical functions without your hand leaving the controls. Dealers, this is your chance to answer your customer’s customizing needs with GripAce™. You both win! Grip Ace is not responsible for any damages or injury caused by improper installation. 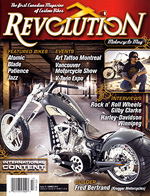 on top custom bikes in magazines!